Underhill L, Oschadleus D. 2013. Citizens who advance science. Cape Times Aug 2: 11. What the ADU is all about is described in this article which appeared in the Cape Times on 2 August 2013. We are grateful to the Cape Times for permission to upload the pdf here. It was the newspaper's subeditor who gave the article its awesome title: "Citizens who advance science." 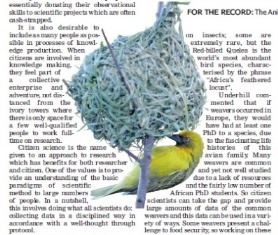 The article mentions PHOWN and includes a photo of a male Cape Weaver at its nest. You can download the article here (1.4 Mb).